It amazes me how news of our small corner of the earth weaves it's way around the world. The fires down in the southern and eastern part of Tasmania have been devastating, the area is about 3 hours from our home, yesterday we were covered in a haze of smoke. More than 100 homes have been lost, fortunately so far no lives have been lost. Friends of ours were evacuated, thankfully there home is safe. Today is cooler and after all the heat of the last week the weather forcast is for snow on Mt Wellington. The rest of Australia is sweltering in the high 30s and 40s!! We are back into the swing of things with The Diva's weekly challenges. Laura's husband, B-rad has designed a fabulous new tangle called phicops. I look forward to seeing all the great new shapes and creations inspired by phicops. I decided to try a spiral and then a funny little fish appeared, can you see it? I love the fish. I must try this pattern. Great job with all 3! Stunning as usual. 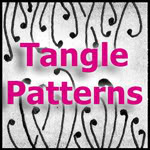 I love your interpretation of tangles. I'm glad you are safe from the fires. All three are perfect examples of the versatility and beauty of B-rad's pattern....phichops....and you're a master of beautiful tangled art! I am sorry to read about the fires....while it is winter here, we had a horrible fire season in the summer too.....so hard on those affected by the dry weather. We will be praying for your part of this beautiful world! Oops., I forgot to say I love the fish! The fish is soooo cute! I am always inspired by your work. Glad to hear you are safe from the fires, we are keeping those in that part of the world in our prayers. My middle daughter will graduate as a teacher this spring and is seriously thinking of applying for work in Australia. That would give me a really good excuse to travel in that direction sometime! 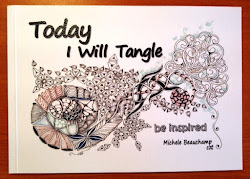 Wow, your work with this tangle is stunning! I love all three of them! So glad to here you are safe from the fires. We had a bad summer filled with smoky air in Colorado last year, so I can relate. Your part of the world will be in our prayers! Your phicops are beautiful--so graceful and elegant. And I love the little fish! It's it wonderful how those unexpected little surprises pop up? I have been thinking of you when we saw the news about the fires. and so glad that you are safe, and no lives where lost. You did a great job with the new lovely tangle Phicops, the fish is a wonderful surprise! Hi Shelly, very well done all three! We were talking about your fire in your district and amazing reading there isalso snow coming???? Hopefully the weather changing for all people in australia. Gorgeous Shelly--couldn't wait to see what you and LeeAnn would do with this...right up both of your alleys! Love the spiral (of course!) and the cute little fishy! All three the tiles are beautiful. The first one is absolutely my favourite. Hope the weather will change in your part of this world. Really great tiles. Just about the time that I think I can identify a favorite I see something in another one that draws my attention. However,I really like the image created by the shading and color in the last one. Also like the transitioning of the other tangles. thankful to hear you are OK. i was getting online to send you a message and saw your new post in my email inbox. prayers going up for your country! flowing with the phicops.. i can hear the wind blowing in your art! These are spectacular. I love your colors, line work, and shading. Your interpretations and flow of Phicops are wonderful. I wonder where that fish has been hiding! Truly amazing work! That fish is not hard to find and looks very busy. These have such great flow to them. I am glad to hear that you and yours are fine. Stay safe and tangle on. All three of them are great tiles. Your spiral looks great especially with the leaves in it. And yes your fish is absolutely gorgeous. The second one has a great flow and has a royal look to me. And the third one great with the touch of red. Hope you and your family will be safe. In our newspaper I saw today a picture of the fire. It was a photo taken by a man, who was photgraphing his wife and his 5 grandchildren, hiding in the sea under a wooden jetty. It s awfull to see the fear in their eyes. Thank God, the are save now. So my thoughts are with you and your beloeved ones. Love all three - you are truly inspiring! Glad to hear you are safe. I love your artwork, it is stunning. Sorry to hear about the fires, I have seen it the news here. Hope you are blessed with some rain to help the fire fighters. Beautiful, Shelly. Love how you have used phicops in a spiral. Perfect! I love you variations in colors and the shape of Phicops! All 3 are beautiful! cute fish too. I look forward to see your works - always lovely - glad you're ok and glad it's not as hot as they predcted today! My gosh, these are awesome. I've never heard of tangling until today. I jumped right on board....I'm a new follower for sure.